For the past several years, I have put out a list of the books that I read in the previous year. Of course, the Bible is always a part of my regular reading. I also don’t include books that I may have started and didn’t complete. I plan to continue this practice in 2019, as well. Usually, listening to these podcasts are part of my morning routine as I walk the dogs or drink my morning coffee. I also divided my books into two categories this year: Spiritual and Business. The Daniel Dilemma, Chris Hodge. Great book about how a Christ follower should navigate the culture without being changed by it in a negative way. Chris Hodge takes the example of Daniel in the Bible and does a great job of relating to today. Win From Within, John Gray. Interesting read as Gray talks about his own struggles and how God has helped him overcome them. The God I Never Knew, Robert Morris. Great book by Robert Morris on the Holy Spirit and how He works in our lives. He shares how he became more acquainted with the person of the Trinity that many are a bit afraid of getting to know more. Own The Moment, Carl Lentz. Lentz shares, in a very down to Earth way, his ideas on materialism, raising kids, and simply living for Christ in a messed up world. Come and See, Todd Wagner. Wagner encourages believers to get back to the Scripture in our relationships with other believers. He shows us how the church has slipped away a bit in areas and how we can get back to what Scripture intended. The One Thing, Gary Keller. This is the book that surprised me the most this past year. I expected a business and real estate book and what I got was an encouragement to focus on what’s important in life and business. Start With Why, Simon Sinek. Why do we do what we do. If we know “WHY?”, that drives us to be our best. What books or podcasts should be on my list to read or listen to this coming year? When 2012 ended, I made a commitment to myself that I would read 30 books in 2013. By “reading,” I meant traditional book format, electronic format, or audible. I thought I would post my list of 30 books for anyone that’s interested. They are listed in the order that I read them this year. With only a couple of exceptions, I recommend all of the books below. My Top SIX for the year are highlighted in red. Here goes! Great read and encouragement in learning how to walk, be led, and depend upon God with every step. I listed these as one because there are so many repeat quotes and the same ideas in each book, it felt like I was reading the same book. Rudy tells his story of leading through the September 11 and more. I especially like his section about communication and how he can to communicate better through owning the material and letting it flow through his passion. Batterson tells the story of how he walked circles around the block, praying and claiming the properties that would eventually be owned by National Community Church. Great book that will build your prayer life. Encouragement to be all you can be. Typical Maxwell. Great book describing Steve’s experience when he died briefly on the operating table, his recovery as he was revived, and what God has taught him through the experience. Book on leadership, “Jesus style”. I read this one with a group of pastors from LifeChurch’s network. Enjoyed discussing the chapters with them. Holiness is often overlooked for busyness but Bridges points out the need to be holy if we’re to experience God. I read this one back in the college years, so this was a re-read of this classic. Every Christian should read this one! Maxwell waited until he was 60 to write this one. He mentioned that you should write your own epitaph before you die. Determine what you want it to say & write ire w/your life. Great view into Camelot and the life of the Kennedy’s. Also gives background on Lee Harvey Oswald. Interesting book. Great short book on Christian stewardship for church leaders. Chris Kyle was the most deadly American sniper in history. He was a Navy Seal and saved countless American lives. His story was interesting. Frances Chan is always a great read. In “Multiply,” Frances challenges us to make disciples. If you are a follower of Jesus, He has commanded you to make disciples. It’s not really optional if you’re following Jesus. Not that great. lol Don’t really recommend this one. Metaxas covered Eric Liddell, Charles Colson, Pope John Paul II, William Wilberforce, Dietrick Bonhoffer, George Washington, and Jackie Robinson. Really enjoyed this one. 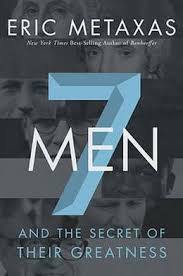 It was a great overview of the lives of these 7 truly great men. It inspired me to look deeper into the lives of a couple of these men. We need more men like these 7 that are willing to live their convictions for Christ. I’ve read Bill O’Reilly’s “Killing Kennedy” and “Killing Lincoln” and enjoyed them both. Since I’d read and enjoyed those two and I am a pastor, it felt natural to read his “historical” account of the life of Jesus. I was very surprised, but this was a very spiritual book for me. I didn’t really expect this from Bill O’Reilly. I highly recommend this book and it is my number one read for 2013. Matt Chandler wrote this book as a study in Philippians. Since Philippians is already one of my favorite books of the Bible, I was ready to pour into this book. It was very encouraging to me and I also shared much of it in my Men’s Small Group. Idleman helps us see how behind every sin that plagues us is a god that we have put before God. His challenge is to let God have first place in our lives. Dungy mixes stories of coaching, football, and life in this challenge to live a live that is different. Gladwell says that he was moved to a closer relationship with Christ as a result of writing this book. 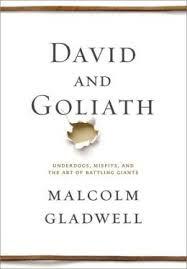 Usually a business writer, Gladwell definitely helped me see David and Goliath in a different light. In the process, he encourages us not to think that Goliath always has the advantage in life. “David” can still win the battle today! Great short “E-Book” that offers short insights and sayings that make alot of sense for business, ministry, and life. They are all written in pithy, twitter style length. This book was a challenge to become the man God calls us to be. Andre is a friend of mine and this book is an instruction manual to prayer and ways to talk to God. It was great reading the book since I have a relationship with the author. Andre is a true prayer warrior and he lives what he wrote. If you’re a new believer and you want to learn how to pray, read this book by Andre. I was encouraged to read this book since I enjoyed “David and Goliath” so much. I found this book very good too. Gladwell says that in most things there is a “tipping point” that leads to a certain outcome, which can be good or bad. Of course in business and ministry, we want to find that “tipping point” that well lead us to reach others more effectively. I recommend this one too. One of the early movers and shakers at Starbucks tells us a few things about how the coffee shop became so successful. Derwin is a great writer and author. In this book, he challenges us to live a “limitless life.” Derwin says that many have “labels” that have been assigned to them, such as “addict,” “afraid,” “damaged goods,” or even “religious.” Our labels can be a lie. When we begin to see ourselves as God says that we are, we can live a limitless life. He encourages us not to listen to the lie that the labels have said about us. Good read! I was excited to get into this one, as Kendall’s book “Total Forgiveness” is one of my all time favorite reads. This book was not as strong as “Total Forgiveness”, but still worth the read. In typical Ortberg style, the author talks objectively about having faith and doubt. Doubt is sometimes looked down upon in Christian circles, but Ortberg addresses it as a normal part of faith. It’s a good explanation of what goes on in many hearts that they won’t speak out loud. Ortberg says that Doubt isn’t the opposite of faith. He says that the very nature of Faith requires a bit of uncertainty. A friend mentioned that she wished she had a list of the best spiritual books. There are so many good books to choose from but I thought I’d post the ones that have helped me the most thought the years. “Experiencing God”, By Henry Blackaby The Blackaby’s have written several books and they are all good. “Experiencing God” is best if you can go through it with a group. Believe it or not, when I teach it, I always use the Youth version. My men’s group of 11 guys are loving it right now. GREAT BOOK that helps you walk through forgiving and understanding what forgiveness is AND what forgiveness is not. “Crazy Love,” by Frances Chan This book challenged me. If you’ve grown complacent in your walk with Christ, this book will shake you up! “Christian Atheist,” by Craig Groeschel Craig says that a “Christian Atheist” says they believe in God but they live like He doesn’t exist. “When God Doesn’t Make Sense,” by James Dobson Sometimes we wonder why bad things happen to “good” people. Dr. Dobson helped me walk through my doubts and wonderings about this several years ago. “Not A Fan: Becoming a Completely Committed Follower of Jesus”, by Kyle Idleman This book challenges the “rich” in the world, and that includes you and me. “Weird, Because Normal Isn’t Working,” by Craig Groeschel Craig says that we should be weird in the way we look at our finances, relationships, money, careers, family, and every part of our lives. Everyone else looks at them “normally” like the rest of the world and they’re a mess! Be weird! “The Pursuit of Holiness,” by Jerry Bridges This is an oldie but a goodie. I read it in college and it really taught me how God calls us to live a holy life. “More Than A Carpenter,” by Josh McDowell This book explores the impact of Christ on the world. Another one that I read in college that helped me stay the course! This isn’t an exhaustive list. These are just the ones that come to mind. These aren’t just “good” books that I have read. These books impacted my life as a Christ follower. What books would you put on this list?